Want to have a private event at Painted.? Pick a date, choose a painting and call us to reserve your space. We host team builders, birthday parties, baby/bridal showers, family gatherings & more! The classes are two hours long, please plan to show up 20 minutes early. There is a 12 person minimum to book Monday - Thursday or Friday morning/afternoon. There is a 15 person minimum to book Saturday & Sunday morning/afternoon. There is a 20 person minimum to book Friday or Saturday nights. A nonrefundable deposit required to book. Pricing is a per person rate and includes instruction, all painting materials, studio time, setup and clean up. Food orders and beverages are available for purchase. Custom paintings are available for an additional charge. Your Private Party time includes approximately 30 minutes after class. This time may be used for celebrations, socializing, cake, lunch/ dinner etc. Additional time available for a studio fee. **Wood Sign Private parties are subject to availbility and require at least four weeks notice. Payment for these special events are due in full 48 hours after booking and are nonrefundable. Need food? We can help! Please call for our menu & options for larger parties. Please see FAQ's or Contact Us for more information! Have less than 12 people? Check our calendar for public classes! Please note: Public classes do NOT include extra studio time after class. 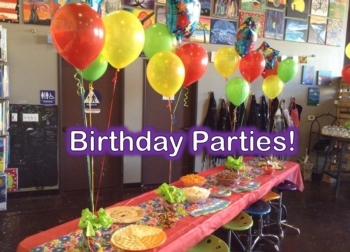 Want to have your child's Birthday Party at Painted!? 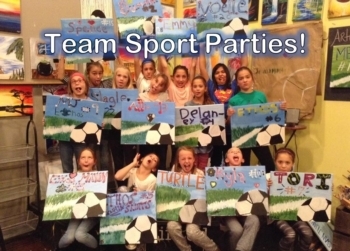 How about a Girl Scout or Soccer Party?? We host parties for ages 6-12. Leave the work to us! Our times are flexible: 7 days a week (No kids parties Friday and Saturday Night). You choose the painting! We offer a list of A La Carte items to choose from: pizzas, cupcakes, goodie bags, snacks & more! Monday-Friday after school or earlier only. You can view our Kids Gallery here. Additional studio time is $30 per half hour. It is recommended invitations include a 15 minute early arrival. Let us come to you! All the fun and entertainment in YOUR setting of choice! And yes, we do work with local restaraunts and wineries for LARGE parties! Travel and set up fee of $100. This includes anywhere within 30 minutes of Folsom, CA. Includes all supplies and materials. Everyone gets to paint their furry friends! Send us a picture of your cat, dog or bird and we will guide you on a masterpiece of your pet! Payment for this party is due in FULL two weeks after booking.